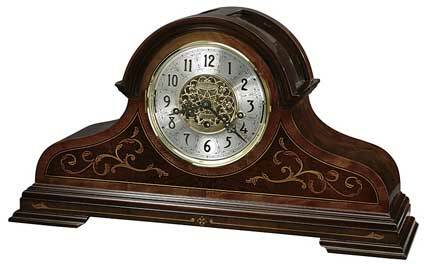 Howard Miller Bradley 630-260 Limited Edition Mantel Clock - Only two thousand will be crafted. The Bradley is finished in a highly polished and buffed Windsor Cherry with fifteen different species of hardwood and veneers. Bookmatched Russian Walnut Burl on the Cherry case features a Movingue border with Ebony and Maple accent lines and decorative inlay consisting of Padauk, Silver Gum, Wenge, Magnolia, Beech, Avodire, Anegre, Pearwood, English Sycamore, and Kingwood. The ornate dial features a pierced, polished brass cast center and applied satin black Arabic numerals on a silver chapter ring. The cast center disk is numbered and specially inscribed with "Limited Edition." Curved, beveled glass panels offer a view of the intricate workings of the brass movement. Polished brass also lines the inside bottom of the case. 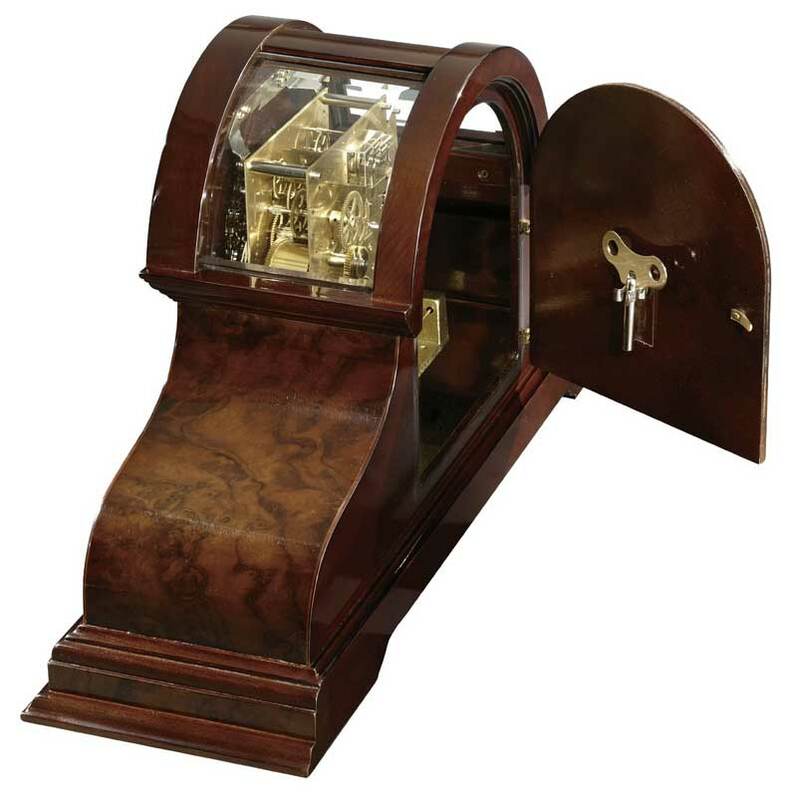 Hinged door on the backside offers easy access to the movement and convenient winding key storage. Finished in Windsor Cherry on select hardwoods and veneers. You will receive a free heirloom plate to place on your clock, engraved with name and date, by returning the enclosed request card to Howard Miller. 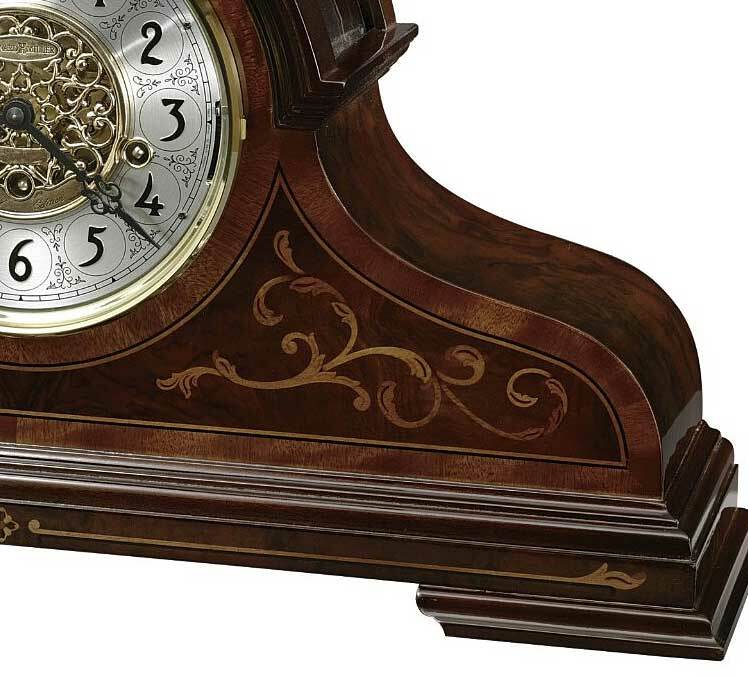 Key-wound, Premium German made Keininger triple chime movement can play three melodies including Quarter hour Westminster chimes, Whittington Chimes and St Michael Chimes on eight acoustically tuned chime rods. Nighttime chime shut-off option will turn off the chimes between 10:00PM and 7:15 AM automatically. Durable bronze bushings and a heavily jeweled movement for longevity. 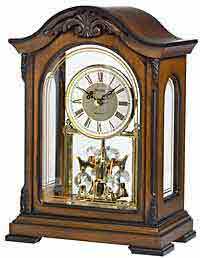 Size: Height 12-1/2" Width 22-3/4" Depth 6-3/4"
Clocks for sale at The Clock Depot including the 630-260 at discount prices.